An emergency cholera hospital is the grimmest kind of medical center, and it’s a symbol of the succession of horrors that have battered Haiti over the last year. Here in Haiti’s central plateau, I visited a cholera treatment center run by an excellent aid group, Partners in Health, in collaboration with the Ministry of Health. Nobody goes in or out without being thoroughly disinfected; to try to control the epidemic, bodies are buried rather than released to families. In one tent, 40 seriously ill patients were lying next to each other on cholera beds — boards with holes in the middle and waste buckets underneath to catch the constant diarrhea. Staff members put a sheet over Tiphay Merilus, 66, just as I arrived. Patients a few feet away in other beds averted their eyes as a sanitation crew carried out Mr. Merilus’s corpse and disinfected his cot. Already, more than 1,700 people have died of cholera in less than a month, and the Pan American Health Organization estimates that 400,000 Haitians may get cholera over the next year. The earthquake in January caused some 250,000 deaths. The death toll was a result not only of seismic activity but also of poverty: shoddy construction and slow rescue efforts meant many more deaths than if the same quake had occurred in, say, California. 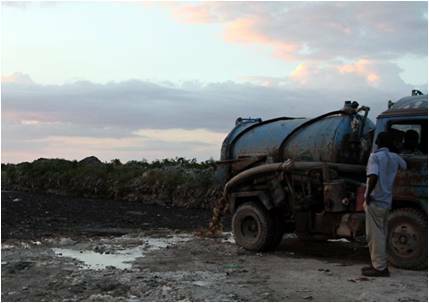 Then came cholera, which is a disease of poverty — abysmal sanitation and lack of potable water can create an epidemic. One cholera patient, Dieulimere Renatu, 21, told me that she gets drinking water from a river. If she were to seek water from a safer source, she would have to spend three or four hours a day fetching water for her family — and then would have less time to work and earn money. Those are the trade-offs that Haitians face. After the earthquake, Bill O’Reilly suggested that humanitarians were romanticizing aid as a solution for Haiti: “One year from today, Haiti will be just as bad as it is right now.” I criticized him at the time, but he wasn’t far off. Haiti has certainly improved since the immediate aftermath of the quake, and aid kept alive many who would otherwise have died. But reconstruction has barely started. Most of the rubble is still waiting to be cleared off, and more than one million people are still living in tents. Part of the problem is that the government, crippled by the quake, has done little. Another is that aid groups created a parallel state that further diminishes the government — and a country needs a central authority to make decisions. The limitations of aid are very much on display in Haiti. After the quake, aid groups rushed in porta-potties to provide sanitation, but they cost $13 a day to clean and empty the wastes. So many thousands of dollars each day go to companies with the specialized trucks that clean porta-potties and then dump the wastes untreated at the city dump. There are solutions. 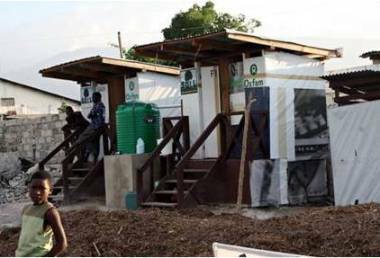 One sanitation aid group, SOIL, has provided 300 dry composting toilets that turn human waste into fertilizer. The composting kills the cholera bacteria and other pathogens within a few days, according to Sasha Kramer, the executive director of SOIL. The compost then provides desperately needed topsoil and fertilizer to boost agricultural production. 1 Reply to "The New York Times: Haiti, Nearly A Year Later by Nicholas D. Kristof,"